Steiner begins the first lecture saying he is adding to things he had said earlier in the July 20 to 23, 1923 lectures compiled in the book, What is Anthroposophy? (1) He leads us on a guided tour through the planets of our Cosmos, which we have come to call our Solar System. The Moon is the mirror of our Universe as it reflects light from the Sun, from all the other planets, and from all the stars to us. As we ponder the Moon, we can learn the Moon's secret: that it holds the spirits that were the great teachers of wisdom to humanity. [page 6] We fight our way through to the original revelations made to humanity that are still behind myths and legends, and with great wonder and awe come to realize that human beings once had a magnificent wisdom given to them as a grace by the cosmic spirits, given in a way that required no effort on their part. And in the end we are taken back to everything those spirits had once been able to teach the early human beings who were then on earth. Now those spirits have withdrawn into the moon fastness of the universe, departing from the earth with the moon. Human beings retained a memory of what those spirits had once revealed to the earliest peoples of the human race who were still very different in their nature from the present-day human form. As we gaze into the face of the Man in the Moon, he smiles down on us as if to represent the Moon's early teachers of wisdom now hidden from our physical sight, but embedded deep within our souls. There is indeed in the Moon "a tie that binds us to our home(2)" on Earth as humans. Continuing his tour, Steiner reminds us that Saturn encompassed the whole cosmos from which the various planets separated. Its inner warmth speaks to us today and lures us to dwell in the past. [page 8] And it speaks of the planetary system's past with inner warmth, an inner glow, which means that it is actually dangerous to be intimately acquainted with anything which Saturn says in the universe, for it speaks of past events in the universe with such devotion that one develops a tremendous love for this past of the universe. Saturn is, as it were, always tempting those who listen intently to learn its secrets to set little store by earthly things and enter fully and wholly into the past, into what earth has once been. Saturn above all speaks clearly about everything the earth was before it came to be earth. It is therefore the one planet in our system which makes the past infinitely dear to us. And it is people who always like to look into the past, not liking progress but always wanting to bring back the past who have an earthly liking for Saturn. This is the way in which we come closer to the individual nature of Saturn. Jupiter's nature is revealed in its alternate name Jove and its role as the wise answerer of unanswered questions(3) for humans. From my earliest reading of the daily comics I came to see the expression, "By Jove!" at the time when some comic character had a great insight revealed. What Saturn does by bringing insight from the past into our mind, Jupiter does by bringing insights of the present into our mind. [page 9] When you try to get a dear idea about some important riddle of existence and find you cannot do so because of the obstacles presented by the human physical and etheric and above all the astral obstacles, the Jupiter spirits will come in to help. The Jupiter spirits are indeed coming to help us to develop human wisdom. When someone has made a real effort to think clearly about some riddle of existence and cannot get to the bottom of it, he will find that if he is patient and continues to occupy himself with the riddle in his mind the powers from Jupiter will even come to help during the night. If someone who has found a better solution to a day's problem during the night, seemingly in his dreams, and were able to know the truth of this, he'll really have to admit: It is the Jupiter spirits who bring movement, swing, and verve into human thinking. It was this kind of thinking: holding long and patiently onto a question, and allowing the answer to present itself in consciousness that led me to understand the power of an unanswered question several decades ago. Mars is the most talkative planet, and shows up in people who talk in their sleep. When someone just talks and talks without end, gossipy Mars is behind it. It is different from Jupiter who wants to convince by a quality of thought, while Mars wants to persuade by a volley of words. It is the Mars personality who says in response to some thoughtful observation, "I know that!" and continues to blather away as if nothing important had been revealed. These Mars types do not understand the power of an unanswered question, being naturally more fond of talking than thinking. [page 10] If there is anything in human nature open to it so that it can make it rattle on, Mars will turn people into chatterboxes. It is the planet which thinks little, has few thinkers but many talkers. . . . It may be called the 'agitator' in the universe. Venus stands apart, however, and does not want to know the universe, feeling that would take away her virginity. [page 11] On the other hand, Venus is tremendously receptive to anything which comes from the earth. In a sense the earth is Venus's lover. The moon reflects the whole universe all around; Venus reflects nothing of the universe, does not want to know about anything that has to do with the universe, but lovingly reflects everything that come to her from the earth. Spying on the secrets of Venus with the inner eye you get the whole earth again with all its secrets of the soul. It is from Venus that every poet receives inspiration through the mirroring of Venus with its sphere surrounding Earth spiritually (in the original geocentric, pre-Copernican sense). [page 11] It is indeed the case that essentially people on earth cannot secretly do anything real in their souls without it being a reflection coming down from Venus, something we discover if we go into the matter. Venus looks deeply into human hearts, for this is of interest to her, it is something she does allow to reach her. Everything which lives in the inmost heart on earth is also found on Venus thanks to a mirroring of an unusual kind. Venus is really transforming everything as it is reflected just as dreams transform the external events of physical life. Venus takes the events on earth and changes them into dream images. The whole orbit in which Venus moves around the earth, this whole Venus sphere, is really a dream state. The secrets of human beings on earth are transformed as in a dream and live there in many different dream forms. Venus actually has a great deal to do with the poets. The poets themselves do not know this, of course, but Venus has a great deal to do with them. After reading the above page 11 passage and my above poem again, I have a new understanding of how Venus was inspiring me at that time, and ever since, by Jove! What about Mercury? Inquiring minds want to know. We tend to think of Mercury as the quicksilver messenger of the gods with winged-heels, but Mercury really excels at rational thinking and providing us with insights. [page 12, 13] Mercury is the planet which, unlike the others, is really interested in anything which is not sense perceptible by nature but so that one can make combinations with it. In Mars we have the masters of making combinations in thinking, in Jupiter the masters of wisdom-filled thinking. When human beings come from pre-earthly life into earthly existence it is the moon impulse which provides the powers needed for physical existence. Venus provides the powers for all qualities of mind and temperament. Mercury, on the other hand, provides the powers for the qualities of our rational understanding. The masters of powers of insight gained by making combinations are anchored in Mercury. If we look at the outer planets of Saturn, Jupiter, and Mars we find them concerned with the freedom of human beings. The inner planets of Venus, Mercury, and Moon are concerned with the destiny of human beings(4). How can a human have a destiny and still be free? This possibility was lost on strict Calvinistic theologians, but is an important part of Steiner's anthroposophy, the science of the full human being. Each human has a destiny based on karmic relationships with other humans over many lifetimes, but always possesses the freedom of choice in how to deal with others. [page 15] The Sun then takes its position among these actions and impulses of individual planets, creating harmony, as it were, between those which make man free and those which determine destiny. The Sun is therefore the individual spirit where destiny-determining necessity and freedom-making principles come together in a truly marvelous way. One will only understand what the leaping, blazing light of the sun contains if one thus sees the interweaving life and activity of destiny and freedom in this light which spreads out into the world and then again keeps warmly together in the Sun. One can imagine modern physicists blasting Steiner's thinking as being a complete folly, and yet, Steiner portrays the silliness of the concepts of those same physicists. The same physicists who followed Isaac Newton's constructed view of absolute time and space and then, when Einstein offered his theory of relativity, had to adopt a view that time and space, mass and energy, were all relative to each other, dissolving forever the view of absolute time and space and the separateness of mass and energy. [page 19] "I direct my telescope towards a distant star. But I have worked out that so and so much time passes before the light from that star gets down to earth. When I look through my telescope, therefore, the light I see has needed so and so many light years to reach it. The light in my telescope was therefore emitted so and so many light years ago. The star is no longer in the place where I see it. The ray of light reaches my telescope, but the star is no longer in the place to which the telescope extends. When I look at a neighboring star, the light of which needs far fewer light years, this light nevertheless gets here at the same time. I move the telescope. The star appears in a point of light which perhaps was there so and so many years ago. Now I move it again. A star appears in the telescope which actually is not there, but has been there a completely different number of years ago. And that is how I form ideas about my starry heavens. All of it has been there since it came to be there but in reality it is not there at all. In reality there is nothing there — everything has gone higgledy-piggledy." This indictment of the physicist shows the complete folly of a materialistic scientist's thinking process, making this an even draw between Steiner and the physicists who call his spiritual science a fantastic folly. During all this havoc in the world of physics, which Steiner lived through in his own lifetime from 1860 to 1925, the world view of anthroposophy remained unchanged, as it is based on direct experience of the spiritual world and not on the abstract logical reasoning and speculation of physicists about the material world. Look at the days of the week carefully and you will see how intimately we live with the planets. We start our week with Saturn-day, then move into Sun-day, followed by our weekdays of Moon-day, Mars-day, Mercury-day, Jupiter-day, and end with Venus-day. French speakers will recognize Mars-day as Mardi, Mercury-day as Mercre-di, Jupiter-day as Jeu-di or Jove-day, and Vendre-di as Friday or Venus-day, but English-speakers use German gods' names for Tues-day, Wodens-day, Thors-day, and Frei-day, and may not notice the full range of planets which fill every week of their lives. Rightly understood, each week, we recapitulate the full range of evolution of our Cosmos going through again the Saturn, Sun, Moon, and Earth Epochs, the planets of Mars and Mercury arising during the middle Earth Epoch, and Jupiter and Venus Epochs following our present Earth epoch. [page 20] The true situation in the spiritual world will really only be clearly understood more widely when people raise the nightcap they are wearing at least a little bit. So it is certainly possible to think that something which speaks in the kind of tenor in which I spoke yesterday is absurd in the face of modern science, for in its theory of relativity, for instance, this science is wholly negative. It is really always telling us what is not, and humanity will need to steer towards insight into what is. Let us get practical and look at what is and find a way to penetrate into the universe. Anthroposophy provides us with such a way by leaving aside the squishy so-called solid foundations of materialistic science. [page 21] Yet what are the solid foundations of science? They are the concepts of space, time and so on which people have gained on earth. Now the relativity theoreticians destroy these concepts where the universe is concerned and declare them to have no validity. The one earthly concept remains valid in the cosmos, that of reflection of the universe by the Moon. The Moon acts like a silvery mirror reflecting the entire universe from its surface, while spirits inside the Moon go about their cosmic business. [page 22] I did, however, say to you that the spirits which are holed up in this moon fastness and in the universe and pursue their cosmic business in there had once been on earth, before the moon split off from the earth. They had been the first great teachers of human souls on earth. The great, most ancient wisdom of which people speak is essentially a legacy from these moon spirits who today live hidden lives in the moon. They have withdrawn there. Why did these wise spirits withdraw from Earth? Were they not like our parents, guiding us on our way into adulthood? Yes, and perhaps that's why they withdrew from us, so that we might achieve our own destiny in freedom from their over-powering influence. Every one knows of people whose parents forced their own careers upon them: a doctor who wanted his son to become a doctor, an actress who wanted her daughter to become an actress, etc. One boy sent to medical school skipped medical classes to study music and became a famous musician. Take Francesco Petrarch for example; he was sent to law school and finally dropped out saying, "I did not want to make a machine of my mind." How could his father, a famous lawyer, know that about his son when he insisted Francesco attend law school? Petrarch went on to become a famous philosopher in the Renaissance and is now known as the Father of Humanism. These are examples of success achieved by ignoring the influence of parents, but likely there are far more examples of lives wasted in unsatisfying occupations by children unable to escape the profession chosen for them by their powerful parents. Truly wise parents know when to withdraw their influence so that their children might live in freedom. [page 22] Those spirits had made the wonderful decision, as it were, to withdraw from the earth, withdraw to a closed place in the universe. There they would pursue their cosmic business far removed from humanity so that human beings would not be influenced any further by them, so that human beings would be able to take in all the impulses of the universe and be free spirits. Those spirits chose a new dwelling place in the universe for themselves, so that freedom would gradually be possible for human beings. When the Moon withdrew from the Earth, the physicists could calculate the weights of their separate masses, the energy required, the speed of the separation, and the subsequent orbit of the Moon around the Earth, always presenting one face to the Earth. In talking about Petrarch's life course, that would be like talking about the money his father wasted on him during law school before he dropped out, instead of the freedom Petrarch acquired for himself in his new course in life. [page 22] Hearing that the moon had split off from the earth, a physicist would simply calculate the speed at which this happened, the energies involved, and all of this always only with earthly energies, earthly velocities in mind. When we speak of the moon the way I did yesterday, those factors are simply	ignored. Yet when we ignore the physical aspects, there remain those decisions, those great cosmic moral impulses. From going on about physics, which do apply to conditions on earth, we come to speak about the universe in moral ideas. We can rattle on about mass, energy, money, etc. in a person's life as if talking about an inanimate object operated on by physical forces, or we can speak about freedom and morality in a person's life. Steiner shows us both sides of the world, the physical and the spiritual, so that we may come to understand the complete set of influences others have on our lives and we have on others' lives. One can say that the true role of a father is teach his son to stand up for himself, we might say, to develop a spine, so that he might stand on his own two feet in freedom and think for himself, at which time the father can withdraw from his direct influence on his son's life. This seems like wise advice, does it not? Now consider the Moon spirits as being the father in a similar scenario in relation to all humanity. What did they do to their offspring, the adolescent child, during the old Moon Epoch when the Moon and Earth were one body? They gave the child a spine, a horizontal spine, so that when the Moon spirits separated, the child could grow into an adult human with a vertical spine, standing on two feet, and operating in freedom. [page 24] When those spirits were still on the earth they acted on the soft, I'd say slimy form that the earth itself and all creation on it once had. And in both human beings and animals the development of the spinal column was connected with the actions of those spirits. The spinal column of human beings and animals is thus a legacy from very early times when the moon spirits were still connected with earthly existence. It can no longer arise today. The spinal column is a legacy, it can no longer develop anew today. 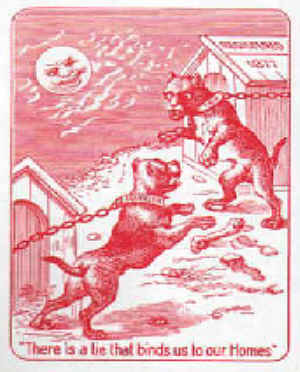 For four-footed animals the spirits fixed the spine in such a way that it remains in the horizontal. For human beings they made it to be such that it could come into the vertical. With the vertical spine human beings could then grow free for the universe and its influences at the moment when the moon spirits withdrew into their moon fastness. In Lecture 3 Steiner asks and answers this wonderful question, "Is it part of the essential nature of the human being to live in the three states: fully awake, sleeping, and dreaming?" (Page 31) He begins his answer by explaining that only humans experience these three states of being on Earth. Animals have a waking state close to human's dreaming state, but their dreaming is never completely unconscious as the human's is. This means animals can awaken to possible threats much quicker and easier than humans. Animals are close to their environment; they lack the distinctly different outside and inside worlds that human beings have. Animals feel a deep connection to plants via either sympathy or antipathy, something lacking in most humans, those who only see the outside of the plant as they were taught to in botany class. Animals know through this deep connection whether a plant is good or bad for it to eat, know whether a plant is helpful for whatever might be ailing the animal. [page 32] Only human beings have this power of making clear, definite distinction between their inner world and the outside world. Why do human beings accept that there is an outside world? What makes them speak at all of an inner world and an outside world? They do so because they are always out of their physical and ether body with their I and astral body when asleep, leaving their physical and ether body to themselves, as it were, in sleep, and are with the things that are outside world. In our sleep state we share the destiny of outside things. Tables and benches, trees and clouds are outside our physical and ether body in our waking state and we therefore refer to them as outside world. In sleep our own astral body and our own I are part of the outside world. And something happens whilst we belong to the outside world with our I and astral body in sleep. During our waking state we deal with the objects around us that we can count, measure, and weigh, similar to what a physicist is taught to do. These objects also possess colors, make sounds, are cold or warm, etc. These are the current conditions under which we human beings live in the waking state. But things change dramatically when we go to sleep. [page 33] When human beings are in the state between going to sleep and waking up, these things are different for the I and the astral body. First of all, the objects determined by measure, number and weight simply are not there. It may seem strange but when we are asleep we do not have things around us that can be weighed, nor things one is able to count or measure in a direct way. When we are I and astral body in sleep we would not be able to use a measuring rod. What we have there are, if I may put it like this, the free floating and moving sensory perceptions. However, at the present stage of evolution human beings are unable to perceive free floating redness, freely moving sound waves, and so on. 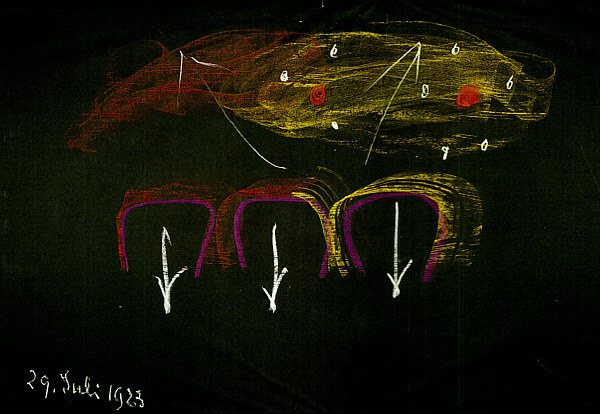 Above right is the colored chalk diagram Steiner drew with his own hand on black paper which has been preserved in a book(5). Whenever possible I use these in place of the black-and-white re-drawn ones which require the use of cross-hatched shading to identify the colors that Steiner refers to. [page 35] There is also something there which is like a kind of measure. You'll discover this if there is a small reddish cloud somewhere, let us say, [Figure 3, at Left] and this is hemmed with, let us say, a mighty yellow form. You then measure, not with a measuring rod, but qualitatively, using the red, which is the stronger color, to gauge the fainter yellow. And where a measuring rod would tell you that you have five meters, the red will here tell you: 'If I were to spread, I'd fit five times into the yellow. I have to expand, grow in size, and then I'll also be yellow.' That is the way of measuring here. Steiner takes us into Figure 2 above again to establish the presence of numbers in the spiritual world which then become measure, number, weight when one returns to conscious awareness. [page 36] If we have one of a particular kind somewhere here, it calls for some, let us say three or five more, depending on how it is [Fig. 2, dots and small circles in red]. There is always an inner connection with the others and the number is something real. When there begins to be conscious awareness about how it is when one is out there with one's I and astral body, one will also come to establish something like measure, number and weight, but of the opposite kind. Soon our seeing and hearing out there in the spiritual world morphs from a floating area of red and yellow light into an order of things we come to perceive as spirits. [page 36] Once seeing and hearing out there is no longer a mere wishy-washiness of red and yellow and sounds but we begin even there to be sentient of things having an order, we begin to perceive the spirits who bring themselves to realization in these free floating sensory perceptions. We then enter into the positive spiritual world, into the life and activities of the spirits. Here on earth we enter into the life and activities of earthly things by weighing, measuring and counting them. Learning the opposite to being heavy in a qualitative way, that is, seeking to expand easily, lightly into cosmic space, measuring color with color, and so on, we begin to grasp the nature of the spirits. Such spirits are also present throughout everything out there in the natural worlds. In the material world, causality rules as I learned as a physicist; in the spiritual world, morality rules as I learned from studying many sources, especially Steiner. In learning something new, I have learned that it's best to know all about it before you start, so I will summarize the remainder of Lecture 3 with a poem. can we know as truth. Can I sleep on it a few days? Oh, yes, Now I remember! In dreams there is beauty. can we create as beauty. like something I dreamed of. can be deemed to be good. In beauty there is good. Truth leads to beauty which leads to good. In the material world, we hold measure, number and weight to be important; in the spiritual world, we hold truth, beauty, and good to be important, in fact, essential for our human spirit. People are known to get sick if they lack enough sleep. Why? Because we need sleep to live in the outside world of consciousness. [page 36] In the waking state of mind we human beings see only the outer aspects of minerals, plants and animals. But in sleep we are with the spiritual element which lives in all these entities in the natural worlds. When we return to ourselves as we wake up, the I and astral body do in a way retain the inclination towards, the affinity with the objects outside, making us accept the reality of an outside world. If we had an organization that was not made for sleep we would not accept the fact of an outside world. It is not a question of someone suffering from insomnia, of course. For I am not saying 'when people do not sleep' but 'if we had an organization that was not made for sleep'. It is a matter of being prepared for something. This is also why people get s ick when suffering from insomnia, for that is not in accord with their nature. But the way things are is that exactly because people dwell with their outside world in sleep, with the world which on waking they call their outside world, they also arrive at an outside world, a view of the outside world. It is our relationship to sleep that provides our concept of truth. Why is that so? [page 37] Well, we call it truth when we are able to recreate the image of something outside within us, when we have a real living experience of something from outside within us. For this we need the institution of sleep. We would have no concept of truth if we did not have the institution of sleep. We are therefore able to say that we owe the truth to the sleep state. To give ourselves up to the truth of things we must also spend some of our time with them. The objects only tell us something about themselves because in our souls we are with them in sleep. Recall any movie you've seen in which a character is deprived of sleep, and you will notice they had trouble understanding what was true. Many coerced confessions are extracted from people who are tortured and deprived of sleep. We can now understand the free floating world of color and sound that Steiner described as happening in the early portion of dreaming when we are only halfway out of our body. The part of our I and astral body in the spiritual world perceives this color and sound of which we are not aware, and that part, while still attached to our physical and etheric body, creates from the colors and sounds the images we experience in the memory of our dreams. [page 37] When we enter in completely, the powers that we unfold in a living, active way in our dream turn into powers of memory. We are then no longer distinct from the outside world. Our inner life comes together with the outside world and we live so powerfully in the outside world with our sympathies and antipathies that we are not sentient of those things as sympathetic or antipathetic but that the sympathies and antipathies themselves assume image nature. We create memory in our dreams and from memory we create something beautiful, creating a kosmos out of the kaos, an order out of the disorder. [page 37] If it were not possible for us to dream, with this dream power continuing on in our inner life, we would not have beauty. The fact that we actually have potential for beauty is due to our ability to dream. In everyday life we have to say that we owe it to dream power that we have a memory; when it comes to art in human life we owe beauty to the power of dream. The dream state is thus connected with beauty. For the way in which we are sentient of something being beautiful and create something that is beautiful is very close to the active, mobile power of dreaming. It is a tiny shift from dreaming to living in beauty; a tiny shift from free-floating chaos into organized cosmos. (Page 38) First we need to understand the meaning of chaos; it is an unruly spreading apart. [page 38] People today will go on for a long time thinking about what one meant by saying 'chaos' in earlier times. The term is defined in many different ways. But the only true way of characterizing the term chaos is to say: When human beings enter into a state of conscious awareness where the experience of weight, an earthly measure, has just come to an end and things begin to be only half that weight yet do not yet want to go out into the universe but remain in the horizontal, in balance, when solid boundaries begin to wave, so that the indefinite aspect of the world is seen still with the physical body but already with the mental constitution of dreaming, that is when we see chaos. And the dream is but chaos floating towards the human being like a shadow. Next we look to the ancient Greeks who taught us how to create beauty from the chaos of the external world around us, i. e., to go from chaos to cosmos. And the chaos floats towards us in our dreams. In dreams there is beauty. [page 38] In ancient Greece people were still sentient of the fact that we cannot really make the physical world beautiful. The physical world is necessarily natural; it is as it is. We can only create beauty from chaos. Beauty arises when we transform chaos into cosmos. Chaos and cosmos are therefore alternatives. We cannot create the cosmos — the real meaning is 'beautiful world' — from earthly things but only from chaos by giving form and order to chaos. And anything we do with earthly objects is mere imitation in material form of chaos that has been given order. We cannot find goodness in the sleep state or in the dream state, only in the waking state. [page 39] But when it comes to human nature we have to understand that if we want to have the idea of truth we have to turn to the sleep state, if we want to have the idea of beauty we must turn to the dream state, and if we want to have the idea of goodness we must turn to the waking state. As I promised earlier, we have now found Truth originating in the Sleep state, Beauty in the Dream state, and Goodness in the Waking state. [page 39] In the waking state, human beings are therefore not determined according to truth, but according to goodness in their physical and etheric organism. So this is where we must really come to the idea of goodness in that case. When modern science seeks to explain the human in the waking state, does it move as Steiner suggests is necessary: from truth to beauty to goodness? Not at all; science tries to explain everything using the external causality of the physical world, blithely ignoring the internal morality of the spiritual world. [page 40] The human being presented in science can only be explained as someone lying in bed. Nothing else is possible. Only the sleeping human being is explained in science. One would have to use mechanical means to set him in motion. This also means that science is a mechanism. Machinery has to be put into this sleeping human being to get this floppy sack moving and out of bed and put him to bed again at night. The sleeping human being has only its physical and etheric body present and is incapable of conscious thought, movement of its limbs, and other expressions of the awake human being. 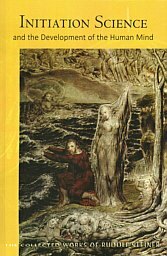 [page 40, 41] Science thus tells us nothing at all about the human being who walks about, is alive and active, is awake. For the principle that sets him in motion lies in the idea of goodness and not the idea of the truth that we initially gain from external objects. . . . The science of this age has never provided real insight into the living human being. Yet, this same science proclaims to be on the verge of creating Artificial Intelligence with the aim of creating an improved human being, aiming to improve on something they understand only superficially. Perhaps science would do better to admit it is researching Superficial Intelligence! But why create expensive superficial human beings when there are so many living examples of inexpensive ones to choose from? To develop a superficial intelligence that creates poetry of fixed stanzas with rhymes and metrical uniformity is possible for these overachieving scientists, and it would not impress me if they did such a thing. If, however, they created a superficial intelligence which could recognize great poetry, that would impress. Everyone recognizes great poetry like great art, feeling a heartfelt response, something an SI machine would not possess the capability of. Steiner says on p0age 43, "No one will find even a trace of art in the physics books today." There is clearly ART in HEART but no ART in PHYSICS. [page 43] Art has been lost today. And the more people go into physics the more inartistic do they grow. Just consider, we have a magnificent science of physics. And there is no need for the opposition to tell us so. As anthroposophists we do say that we have a magnificent science of physics. But physics lives by repudiating the artistic element. In every single aspect it lives by repudiating the artistic element . . . In my career, I did not grow less artistic as I studied physics, but over a decade, I began to feel that something was missing in my heart. I found it when I began to do wood sculpture at the age of 29. I thought I was not an artist because I couldn't draw the face or figure of a person, but when I took a gouge in my hand I could find, hiding inside a piece of pecan or walnut, a beautiful face or figure. I studied physics to find out how the physical world worked, and soon I set about finding out how the full human being worked, first through computers (which worked as the human brain worked), then through psychotherapy, and now through anthroposophy. What was perception like for a human being before the fifteenth century? They had never been taught to determine everything by physical units of measure, weight, number, etc. They saw free floating colors and felt in their heart the tapestry of colors in the world around them. Still able to view spiritual reality a bit, they saw golden colors which surrounded the heads of saints and great moral personalities, and they painted those colors. One only has to view the paintings of Cimabue to see the brilliant colors he perceived in the world around him. This way seeing was gradually fading away and soon painters began painting only the surfaces of humans, like Raphael did with his Madonna. [page 44] What potential lay in this way of living in sensory perception free from all weight? It made it possible, for instance, to see a person one was approaching not the way people are seen today but one would look at the person as something which had been brought about by the whole universe. The human being was more a coming together of the cosmos. He would be more of a microcosm than everything that is within his skin on the small bit of ground on which he would be standing. They were more seeing a reflection of the world in a human being. Colors would flow in from all sides to give the human being his colors. The harmony of the world was there, sounding through the human being, giving him his form. [page 44, 45] They would say: 'The human heart is the outcome of the gold which lives everywhere in the light, gold which comes streaming in from the universe and actually creates the human heart.' The way they saw it was this: Light moves through the universe and the light bears the gold [See Figure 4 above right]. Gold is everywhere in the light, it is alive and active in the light. And during life on earth the human heart — as you know, it changes: every seven years — is not made up of the cucumbers and lettuce and roast veal which people have been eating but, and the ancient teachers knew it, of the gold in the light. The cucumbers and the lettuce merely provide an impulse so that the gold which lives in the light makes up the heart out of the whole universe. Steiner has given us moderns a way to understand the haloes of gold which surround the heads in old paintings. The cartoon depictions of haloes as circles floating atop the head is a gross simplification made possible by our flattened modern perception of the outside of things. [page 45] In the past, painters painted out of the universe, for things did not have weight then. This has gone; last traces can still be seen with Cimabue, for instance, and above all in the Russian icons. 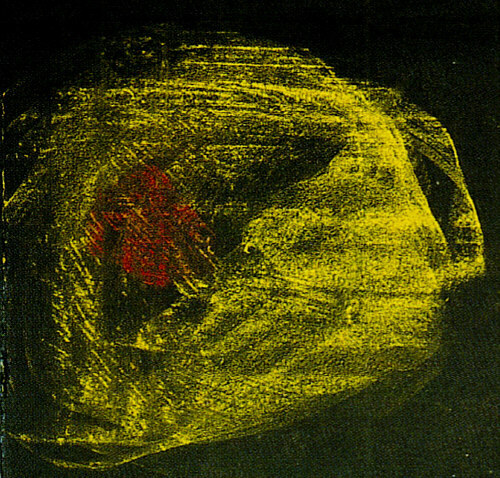 The icon is still painted out of the outer world, out of the macrocosm; it is a detail from the macrocosm. Then, however, a dead end was reached. It was not possible to go any further, because humanity simply no longer had the eye for it. To be inwardly involved in painting the icon and not just do so in the traditional way, one would have needed to know how to treat the gold. The treatment given to the gold in the painting was one of the greatest secrets in the art of painting. To let the human form arise against the background of gold — that was the old way of painting. In Lecture 4 Steiner reveals the true nature of the human being by focusing on the importance of the time we spend sleeping. He asks us to remember our life and then points out that the only things we can come up with are day-time, non-sleeping-time, memories. What happens when we are asleep during that time of which we have no memories? Our I and astral body leaves our etheric and physical bodies lying on the bed. This leaves us with a question. If our I or Ego feeds our circulation, what takes their place at night when our blood continues to pulsate through our arteries? If our astral body lives in our whole breathing process, how is it we continue to breathe when it has vacated our sleeping body? The answer will likely surprise you. Consider your sleeping body like an automobile stranded on the side of the road because it has run out of gas and the battery is dead. What do you do? Call AAA and help will be on the way. What is the Triple-A of the spiritual world which comes to our body's aid at night when it is left stranded by the I and astral body? This spiritual AAA consists of the Angels, Archangels, and Archai to help keep the blood pulsating, and they come with three friends from the next higher hierarchy to help keep the breathing going. [page 56] In sleep life, our astral body leaves the organs in us which are our respiratory organs, for instance. Our I leaves the powers that make the blood pulsate. Now what do they do during the night? Well, the situation is that when the individual has been lying in bed, with his I departing from the blood-pulsating powers, spirits from the next higher hierarchy enter into the blood-pulsating powers. Angeloi, Archangeloi and Archai then live in the self-same organs in which the I lives during the waking hours of the day. And the spirits of the next higher hierarchy are during the night active in the respiratory organs from which we departed because our astral body has left us: Exusiai, Dynamis, Kyriotetes. The etheric body during the day and the night-time needs help from the Seraphim, Cherabim, and Thrones to thrive. The physical body would be an inert mass of atoms were it not for the peak of the spiritual hierarchy which lives in it. [page 56] And then the physical body! If we had to manage all the magnificent, tremendous processes in our physical body ourselves we would not only do this badly but we would not at all know how to set about it; we'd be quite helpless. The things said about the physical body in external anatomy would not be able to set a single atom of it in motion. This calls for very different powers. These powers are none other than those which have from time immemorial been known as the powers of the highest trinity, Father, Son and Spirit, the actual Trinity which dwells in our physical body. . . . So we are able to say that throughout our life on earth the physical body is not ours; it would not go through its development under our direction. As has been said in ancient times, it is the temple of the godhead, the godhead which is a trinity. Last night my wife and I watched a marvelous movie called "The Shack", a 2017 movie which illustrated the presence of the Trinity in the life of Mack who nearly died when his vehicle was rammed by a large 18-wheel transport truck. All the spiritual hierarchies arrived to attend on this man, but the Trinity was the only one Mack was shown as experiencing directly. Papa, Jesus, and the Spirit invited him into their Temple, the Shack, and helped him learn to forgive the two men who had devastated his life before the accident, giving Mack, at movie's end, the option to remain with the Trinity or return to his family. Anthroposophy is difficult for people to comprehend, leading to many people misinterpreting what they do not understand. 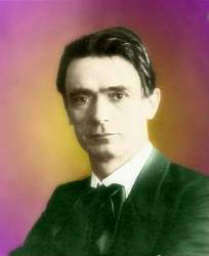 Rudolf Steiner gives us a wonderful metaphor involving logarithms. In high school I learned to use logarithm tables, and with the advent of calculators, log tables have disappeared from the curriculum, so far as I know, so a quick word about them. It is easier to add than multiply, especially with four digit numbers, isn't it? If you wish to quickly multiply two numbers, find the log of each number in a Log Table, add them together, and the result will be the log of the two numbers multiplied together. Much quicker than doing the long multiplication. Slide rules appeared when I went to college, and I discovered I could multiply quickly with the slide rule because the numbers were ruled in logarithmic progression. What do Log Tables look like? A table of 4 digit numbers resembling random house numbers. [page 150] Kuno Fischer, the well-known professor, said that he had two colleagues at school who were brothers. They had an uncle who was an out-and-out simpleton. The time came when they were learning about logarithms in mathematics and needed to buy logarithm tables. The uncle took a look at these tables. He saw nothing but figures on them, and so he asked these schoolboys, his nephews, what kind of figures these were. They had no idea how to introduce him to logarithms. Finally one of the two young rogues had an idea: 'Yes, those are all the house numbers in Europe.' The uncle believed him, and decided that this was really quite useful, to know all the house numbers in London, Paris and so on instantly. My point is that people who read Steiner's lectures lightly, without deep understanding, are like the uncle looking at log tables and seeing only house numbers. They may apply their abstract thought processes to his lectures and miss the deep reality present in his words and images. By doing so, the spiritual life they earnestly need eludes them. [page 155 italics added] The people of our time need this kind of spiritual life — not materialistic life — so that they may be the human beings of the future. Because human beings have come to think and form ideas in an abstract, powerless way, I would say all inner ways of life they have developed have become such, for the time being, that with present-day education it really is the case that to speak to them of things of the spirit has the same effect as speaking of logarithm tables to the simple-minded uncle. When mighty signs do after all come up here or there for the desire of the spiritual world to come in, people misinterpret this, as if they were the house numbers of Europe. One of the mighty signs is the advent of three states of mind which is close upon us. To understand what this is, one needs to look at how we have come through two sets of states of mind during the development of our human mind. In olden times, we dreamt in images, slept with an aftertaste of our dreaming upon waking, and we knew the stage of deep sleep. From this stage we developed into our present stage of dreaming, sleeping, and waking. The new states of mind we can expect in the future will be: subdued dream sleep, ordinary waking state, and a hyper-awake state. We have arrived in the age of freedom with a new spirituality and have the ability with our free powers of insight to live out our individual lives to the fullest. See Bobby's 2006 review of these lectures here: http://www.doyletics.com/arj/whatisa.shtml. This was the slogan under the haunting image on the back of the Bulldog Squeezers' playing cards which puzzled me in my youth. "What is the power of an unanswered question?" is Matherne's Rule No. 25. Rightly understood, the power comes from holding the question long enough to receive an answer from Jupiter, by Jove! NOTE: inner and outer refers to the position of the planet relative the orbit of the Sun in the spiritual or pre-Copernican geocentric way of looking at orbits as concentric spheres with the Earth as the center. In that system the Sun and the Moon were considered as planets. 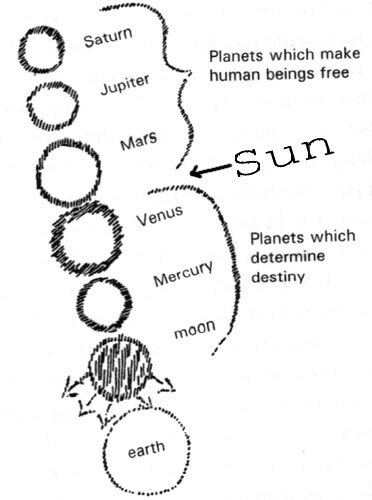 Note the diagram shows the original designations of Mercury and Venus whose names materialistic astronomers have blithely switched.